Researchers at the RIKEN Evolutionary Morphology Laboratory and the University of Tokyo in Japan have determined that the eardrum evolved independently in mammals and diapsids—the taxonomic group that includes reptiles and birds. 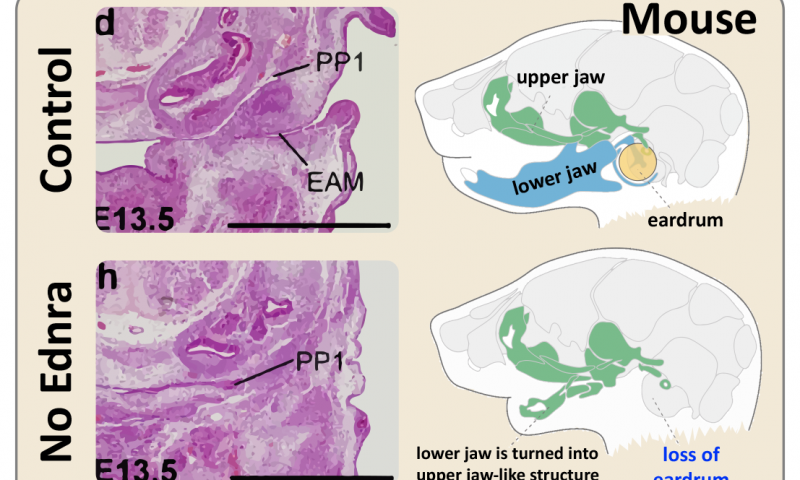 Published in Nature Communications, the work shows that the mammalian eardrum depends on lower jaw formation, while that of diapsids develops from the upper jaw. Significantly, the researchers used techniques borrowed from developmental biology to answer a question that has intrigued paleontologists for years. The evolution of the eardrum and the middle ear is what has allowed mammals, reptiles, and birds to hear through the air. Their eardrums all look similar, are formed when the ear canal reaches the first pharyngeal pouch, and function similarly. However the fossil record shows that the middle ears in these two lineages are fundamentally different, with two of the bones that make up the mammalian middle ear—the hammer and the anvil—being homologous with parts of diapsid jawbones—the articular and quadrate. In both lineages, these bones connect at what is called the primary jaw joint. Although scientists have suspected that the eardrum—and thus hearing—developed independently in mammals and diapsids, no hard evidence has been found in the fossil record because the eardrum is never fossilized. To overcome this difficulty, the research team and their collaborators turned to evolutionary developmental biology—or "evo-devo." They noted that in mammals, the eardrum attaches to the tympanic ring—a bone derived from the lower jaw, but that in diapsids it attaches to the quadrate—an upper jawbone. Hypothesizing that eardrum evolution was related to these different jawbones, they performed a series of experiments that manipulated lower jaw development in mice and chickens. First they examined eardrum development in mice that lacked the Ednra receptor, a condition known to inhibit lower jaw development. They found that these mice also lacked eardrums and ear canals, showing that their development was contingent on lower jaw formation. Next, they used an Ednra-receptor antagonist to block proper development of the lower jaw in chickens. Rather than losing the eardrum, this manipulation created duplicate eardrums and ear canals, with the additional set forming from upper jaw components that had developed within the malformed lower jaw. To understand how the eardrum evolved twice and why it is associated with different jaw components, the researchers looked at expression of Bapxl—a marker for the primary jaw joint—and its position relative to the first pharyngeal pouch. 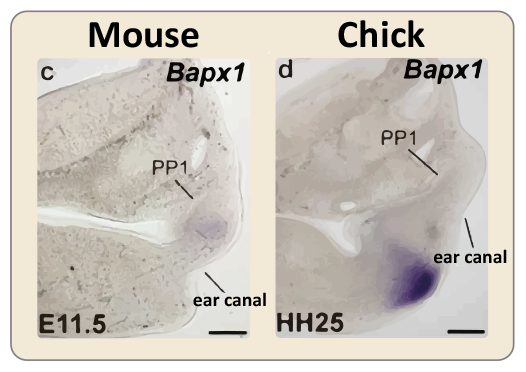 They found that in mouse embryos, Bapxl was expressed in cells slightly below the first pharyngeal pouch and that in chickens it was expressed considerably lower. This difference forces the eardrum to develop below the primary jaw joint in mammals, necessitating an association with the lower jaw, and above the joint in diapsids, necessitating an association with the upper jaw. 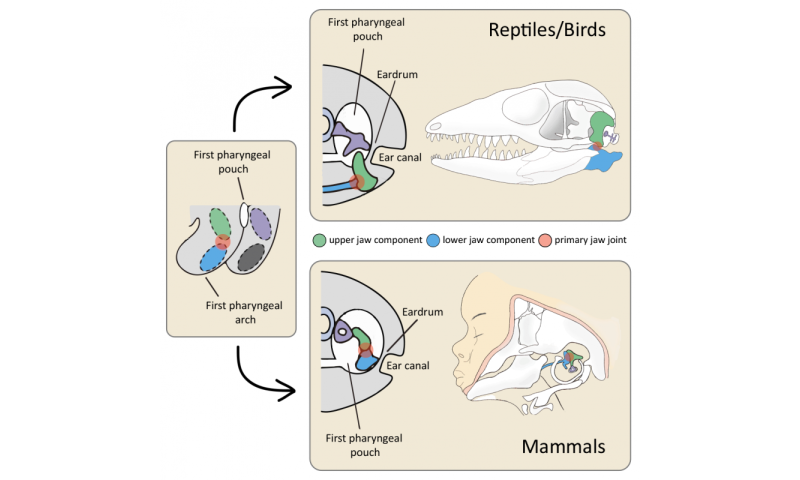 While scientists still do not know how or why the primary jaw junction shifted upwards in mammals, the study shows that the middle ear developed after this shift and must therefore have occurred independently after mammal and diapsid lineages diverged from their common ancestor. Emphasizing the importance of this evo-devo approach, Chief Scientist Shigeru Kuratani notes that, "convergent evolution can often result in structures that resemble each other so much that they appear to be homologous. But, developmental analyses can often reveal their different origins." For structures like the eardrum that do not fossilize, the evo-devo approach is even more important. Lead author Masaki Takechi speculates that, "this approach to studying middle ear evolution could help us understand other related evolutionary changes in mammals, including the ability to detect higher toned sounds and even our greater metabolic efficiency." Mesozoic mammals—what do we know from China?